Thoughts on the identity of Mrs Mary Henry or McEwan, her ancestry, and her heirs. There is a document created in Jan 1848 at Alloa (Service of Heirs), which documents the rights of a Mary Hendrey wife of Alexander McEwan to a property in Alloa. I have not seen the original and this information was supplied by another researcher. In this document Mary was identified as Mary Hendrey wife of Alexander McEwan and the only child of Robert Hendrey, Sailor, deceased, who in turn was the eldest son of Mary Henderson & her lawful husband Daniel Hendrey in Craigward. Seemingly it states that Mary's grandmother Mary Henderson was the daughter of Robert Henderson of Craigward and Mary had inherited rights to the property through a her grandmother's sister, Catherine Henderson, her great aunt, a further daughter of Robert Henderson of Craigward. Although the property in Alloa is not identified it would seem likely to be the one and the same as the one in the advert and the Mrs Mary Hendry or McEwan wasalso one and the same as the one in the advert. The ancestry outlined therein suggests that if there were any link between Mary Hendry and Ebenezer Hendry, that it was not overly close. Although Mary's mother is not named in this document I believe Mary Hendry's parents were Robert Hendry and Christian Marshal and her birth\baptism was recorded in the Alloa parish register "Henry - Mary, lawful daughter to Robert Henry, Tennant in Craigward and Christian Marshal his spouse. Born the 23rd Aprile and Baptised the 4th May 1777". Obviously Robert is described as Tennant in Craigward and not sailor as per the later document, however the "in Craigward" would seem to suggest this is her birth. Unfortunately I can find no marriage record for Robert Hendry and Christian Marshal, nor records of any other children born to the couple. Robert Hendry baptised on 18 Jan 1753 in Alloa, Clackmannanshire. Mary Hendry baptised on 5 Sep 1755 in Alloa, Clackmannanshire. John Hendry baptised on 27 Aug 1758 in Alloa, Clackmannanshire. William Hendry baptised on 15 Jun 1761 in Alloa, Clackmannanshire. Margaret Hendry baptised on 15 Jan 1764 in Alloa, Clackmannanshire. Jean Hendry baptised on 19 Apr 1767 in Alloa, Clackmannanshire. As to the parents of Mary Henderson, Mary Henry's paternal grandmother, Mary's father was named as Robert Henderson in the document, and it would seem likely that she was the daughter of Robert Henderson and mary Nuccol (Nicol) as there is a record in the Alloa parish register of both a Mary Henderson, born\baptised on 17 October 1725, and a Catherine Henderson, born\baptised on 13 September 1723, to this couple which would fit. I have not found a record of a marriage of a Robert Henderson and mry Nuccol, but there is a record of a third child, James Henderson, born\baptised on 4 July 1731 to this same couple in the Alloa parish register. John Hendry was christened on 1 Sep 1717 in Alloa, Clackmannanshire. James Hendry was christened on 17 Jul 1719 in Alloa, Clackmannanshire. Margaret Hendry was christened on 18 Jun 1721 in Alloa, Clackmannanshire. Robert Hendry was christened on 19 Apr 1723 in Alloa, Clackmannanshire. Daniel Hendry was christened on 9 Jan 1726 in Alva, Clackmannanshire. Anne Hendry was christened on 17 Jul 1731 in Clackmannan, Clackmannanshire. Alexander McEwan or McQueen and Mary Henry, and their children. I do have further information of their childrn and grandchildren, which is available on request. Mary Henry and Alexnader McEwan or McQueen had the following known children. Alexander McQueen was born on 1 May 1799 born on 1 May 1799 and baptsed on 15 May 1799 in Alloa, Clackmannanshire. Alexander McQueen, a Spirit Dealer\Grocer firstly married Jean Carmichael on 20 Jun 1823 in Alloa, Clackmannanshire. Alexander McQueen born on 1 Nov 1824 and baptised on 21 Nov 1824. Catherine McQueen born on 27 Aug 1826 and baptised on 17 Sep 1826 in Alloa, Clackmannanshire. Thomas McEwan born on 5 Jun 1828 in Alloa, Clackmannanshire. Jean McEwan, nee Carmichael, would seem to have died in 1828, as she is commemorated on a headstone in Tullibody churchyard. The dated from the transcription on the internet is given as 30.5.1828, but as Thomas her son was recorded as born on 5 June 1828 it would seem that either the parish clerk made a mistake or the date of her demise is wrong. In the latter case possibly Jean died shortly after the birth of Thomas i.e. 20.6.1828 or perhaps ten years on 20.9.1838? If anybody is in a position to confirnm this or provide a hoto of the gravestone it would be appreciated. Alexander McEwen secondly married Jane Young on 29 Aug 1837 in Alloa, Clackmannanshire. Jane was born about 1799 in Stirlingshire. William Young McEwan baptised on 12 Apr 1839 in Clackmannan,Clackmannanshire. Jane McEwan, nee Young, died on 29 Oct 1870 in New Sauchie, Clackmannanshire. Alexander McEwan died on 24 May 1881 in New Sauchie, Clackmannanshire. Both Alexander and Jane were commerated on headstone in Tullibody Churchyard. Robert NcQueen was baptised on 12 Aug 1801 in Alloa, Clackmannanshire. Robert McEwen, a Maltman, firstly married Janet Philp on 27 Nov 1829 in Alloa, Clackmannanshire. Alexander McEwan born on 6 Dec 1830 and baptised on 29 Dec 1830 in Alloa, Clackmannanshire. David McEwan born on 29 May 1833 and baptised on 16 Jun 1833 in Alloa, Clackmannanshire. Robert McEwan born on 2 Oct 1835 and baptised on 18 Oct 1835 in Alloa, Clackmannanshire. Robert McEwan secondly married Ann Duncan on 11 Oct 1850 in Alloa, Clackmannanshire. It is believed there were no children born to this union. Robert McEwan died on 18 Aug 1883 in Cambus, Clackmannanshire. Margaret McQueen was born on 20 Jul 1805 in Alloa, Clackmannanshire. Margaret McEwen married Alexander Hutchison, a farm grieve, on 18 Dec 1829 in Alloa, Clackmannanshire. Alexander was born about 1796 in Logie, Stirling. Mary Hutchison born on 18 Sep 1830 and baptised on 3 Oct 1830 in Muckhart, Perthshire. James Hutchison born on 1 Feb 1834 and baptised on 16 Feb 1834 in Muckhart, Perthshire. Alexander Hutchison born on 1 Jun 1836 and baptised on 22 Jul 1836 in Muckhart, Perthshire. Robert Hutchison born on 1 Jan 1841. and baptised on 31 Jan 1841 in Muckhart, Perthshire. Margaret Hutchison, nee McEwan, died on 5 Jun 1894 in Merryhills, Muckhart, Perthshire. William McEwan born on 10 Sep 1807 in Alloa, Clackmannanshire. William McEwen, a grocer, married Isabella McLaren on 18 Jan 1830 in Alloa, Clackmannanshire. Isabella was born about 1803 in Clackmannanshire. Alexander McEwan born about 1831 in Alloa, Clackmannanshire. Isabella McEwan born on 26 Jul 1833 in Alloa, Clackmannanshire. Mary McEwan born on 22 Nov 1835 in Alloa, Clackmannanshire. Isabella McEwan, nee McLaren, died in 1875 in Clackmannan, Clackmannanshire. William McEwan died on 9 Nov 1879 in Sauchie, Clackmannanshire. Catherine McEwan was baptised on 19 Aug 1809 in Alloa, Clackmannanshire. Nothing more currently known. For the 1841 census Alexander and Mary were recorded in the village of Cambus with Alexander working as a "Malman2, (brewing). His wife is recorded with her maiden name and as a "Female Servant" which I assume signifies that she was assiting him. It woud seem that Mary McEwan died in 1850 as she is commemerated on the McEwan headstone in Tullibody Churchyard, with a date of death of 3 September 1850.
for the 1851 census the widowed Alexander, now aged 73, was recorded resident in a Bothy nearby Alloa. Whether this was a permanent abode or tempory accomodation whilst he worked as an agricultural labourer, given as his occupation, is unclear, but I would suspect the latter. for the 1861 census Alexander, aged 84, was recorded as a retired labourer living in Cambus, Clackmannanshire. Alexander McEwan died on 21 June 1865, in Sauchie, Clackmannanshire. He was recorded as aged 89, a Brewer's assistant, and then widower of Mary Hendrie. He was identified as the son of Alexander McEwan, a labourer, and Catherine Welsh, both marked as deceaesed. The informant was his son Alexander McEwan, Sauchie.. 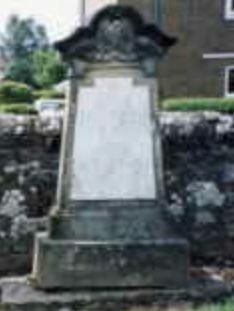 He was commemorated on a headstone in Tullibody Churchyard along with his wife Mary, and his son Alexander McEwan and the two wives of Alexander junior, Jean Carmichael and Jane Young.